You may or may not know that I refuse to read the backs, sideflaps, forewards, etc of any book before I have read it. 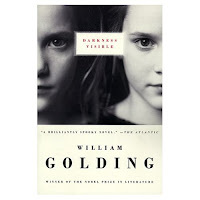 As such, as soon as I finished Darkness Visible, I read everything I could get my hands on. Reason being: it was so obscure, that I wanted to see if anyone 'got it'. After reading a bunch of reviews, I found out that people are all over the map on this one. There was only really one person, I more-or-less agreed with. The book is essentially about a boy named Matty that survives a fire and is scarred for life. As a child, he witnesses the death of a school acquaintance and is blamed for it by his child-molesting teacher. Matty never gets over the thought of letting his teacher down. He becomes very religious, and experiments with the idea of divinity as well as the occult (it is not known for sure, which he embraces more). The parrallel story involves two twins, who grew up quite wholesomely, it seems. Sophy, the less attractive of the two, continues to vie for her father's attention (who is preoccupied with finding a wife). She ends up despising her father, moving in with a thief and getting into sexual and unlawful mischief involving kidnapping of children of political figures. Anyway, the book is interesting... and the theme around 'vieing for attention from role models' seems to be central to the novel, IMO. Terrorist & sexual mischief all seem to stem from this central theme. There is an attempt to explain the darkness of man, and how people are governed by this impulse that they cannot explain or fight... they find themselves doing what the darkness tells them to. It's interesting, but not explained very well by Golding. Overall, I give this book a 3/5.